We’ve all seen tears and tantrums after telling someone they’re fired but what about witnessing a worker wreck a US$6.6 million (S$8.9 million) plane as payback? That’s exactly what one video claims to have captured in Russia. The footage shows a passenger aircraft being partially crushed by a large plane with several media outlets reporting that the damage was being carried out by a disgruntled former employee who’d just been dismissed. The aircraft appears to belong to the UTair Aviation fleet, headquartered at Khanty-Masiysk Airport and based at Roshino International Airport near Tyumen. 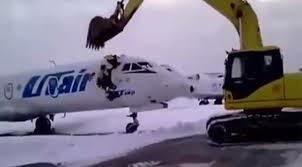 Released widely on both LiveLeak and YouTube, the original version of the video was captioned; “Pilot owed some money tractor driver” and multiple copies of the video have been captioned “Airport Worker Destroys Jet After Getting Fired”. However, despite the apparent carnage, some users have questioned the authenticity of the footage, claiming the company actually planned to have the vehicles destroyed.